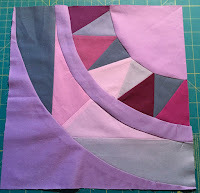 I love foundation paper piecing and can tolerate putting curves together, but having to put 5 of them together was long. For the colour choice, since I had quite a bit of the light purple, it got the honour of being the background colour. The other pieces were added, mostly based on the size of scraps I had. 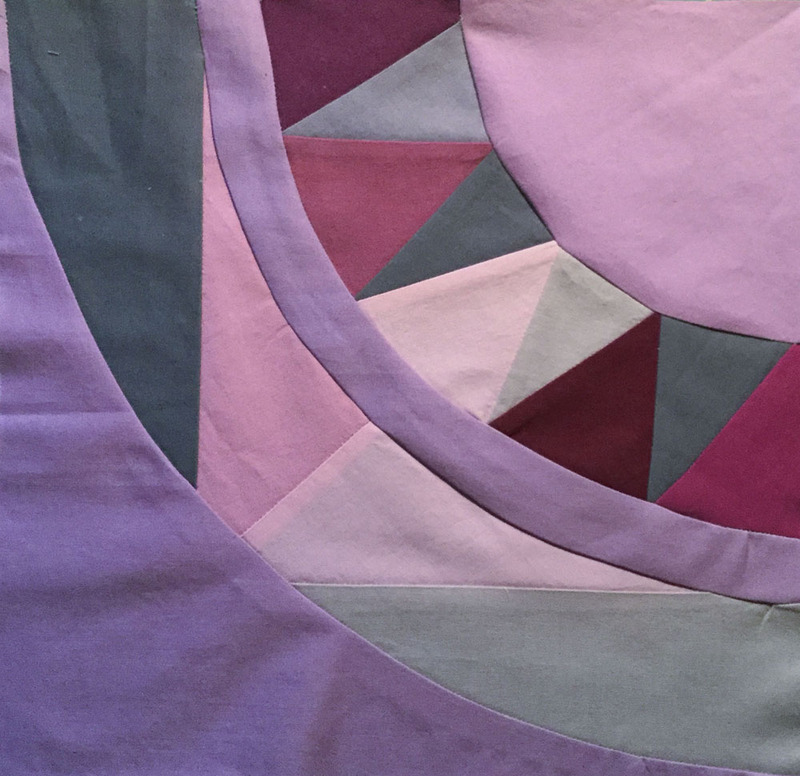 I did deviate from Alida's two blocks by using the Block 1 pattern piece for the bottom curve, while the rest is from the Block 2 pattern. I had originally thought of making both blocks but after the curves of this one, I was done!!! 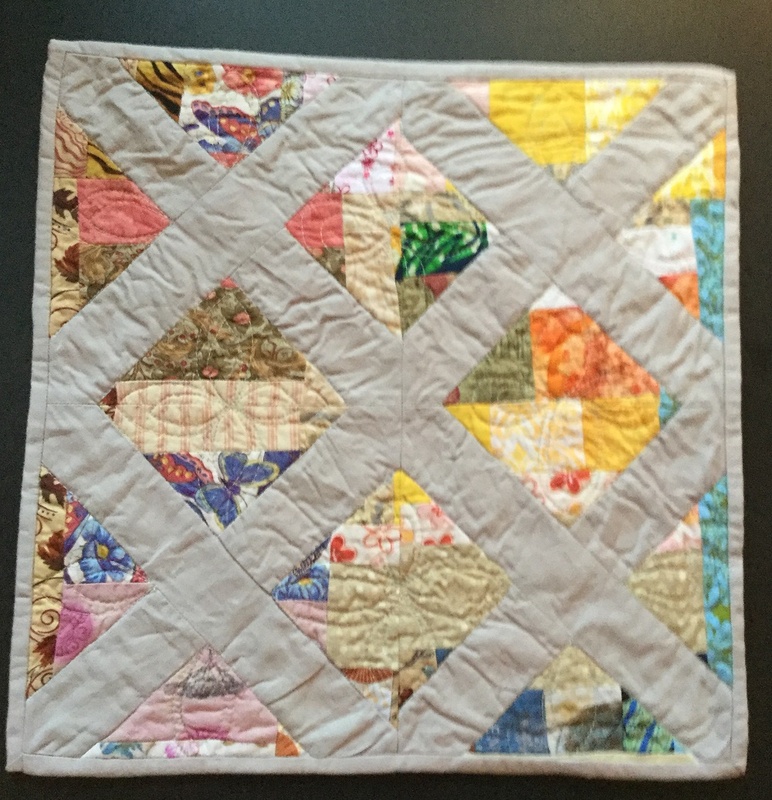 Each year I donate a small quilt to our Workplace Charity Campaign. This year, the Sergeant is it!When I was getting him ready to take to work, I realized that it didn't have a label. I'll be making a 3" foundation paper pieced block that is a variation of the maple leaf. 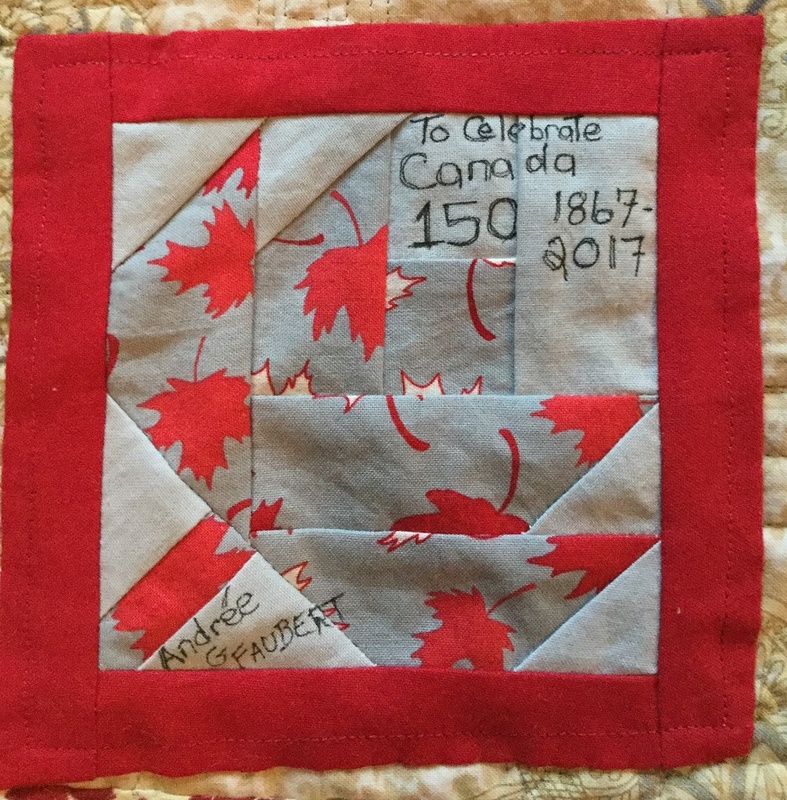 I can either make the leaf in a light colour so that I can print within it and have a colourful border, or I can make the leaf in one of the Canada 150 fabrics and just add a piece to the block to print on. I guess it will depend on what fabric I find first! Update: I just finished the quilt label and quilt sleeve. It's all ready for the auction - and that's a project crossed off my To-do Tuesday list! One or two curves is fine - 4 is excessive! My curves did get better by the fourth one, even if by then I didn't care much about accuracy. I've had a great time making Alida's blocks in her QAL. It hasn't always been easy to get it done within the month, but I'm quite happy that I managed it. 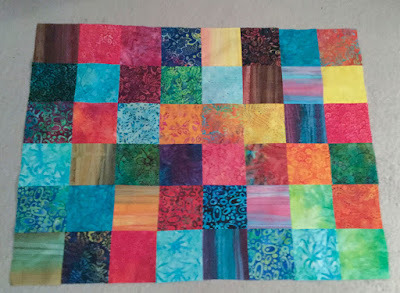 I haven't decided how I'm going to sash and finish the quilt yet. There is no hurry since I still haven't found my first three blocks yet! 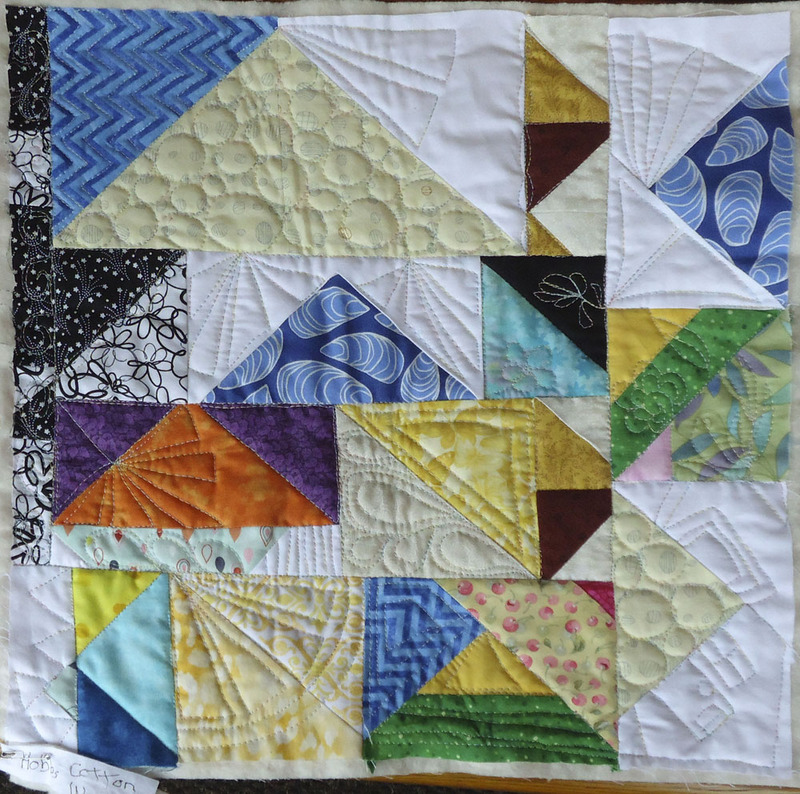 Quilting on the Square - sign up to their newsletter for great monthly 3" foundation paper piecing patterns. In the November Learning QAL, I very optimistically said that I would try out the 4 types of batting on wholecloth quilts. I started the second wholecloth quilt Thursday night. Since it's essentially just following the pattern of the fabric, it's not that difficult. The hard part is making the decision of which thread to use where! 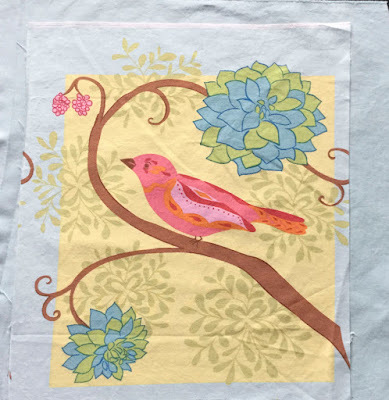 You may be able to see two upside down birds that I've x-ed out, on the fabric. I don't care about the direction of the plants but didn't want the upside down birds. 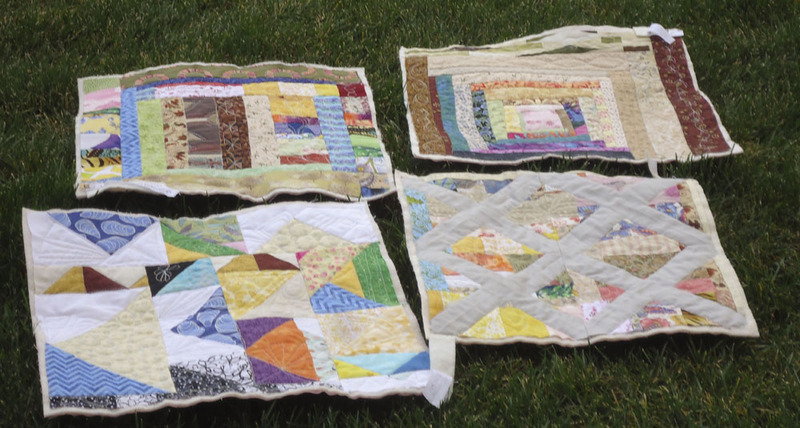 I x-ed them out in the hopes that I won't quilt them by mistake. The marks will come out when I iron the piece. I used the cotton-wool batting for this project because I would love to have the extra loft. In my last batting experiment, I found that once the quilts were washed, there was little difference in the loft of each. Since I don't expect to wash this one, I'm hoping that the cotton-wool batting will give me the best result. 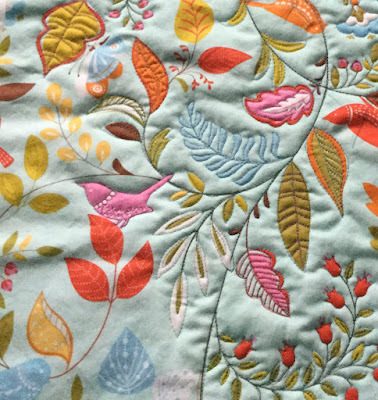 Here's a closeup of the FMQ. You can see the bird in red and some of the plants. This is roughly the same section as the top, but in reverse. 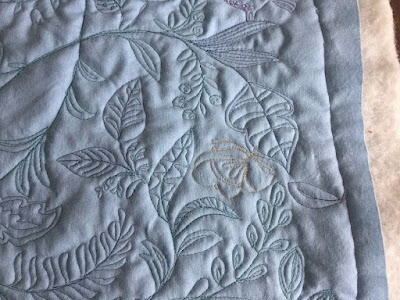 It's so weird looking at all of this colour and not seeing it on the quilted side :-) I'm really hoping that I'll be able to add more colour once I've outlined the pattern. Then I'll be able to follow the FMQ and see exactly what I'm doing. Closeup of the pattern that I'm quilting. Isn't it amazing? 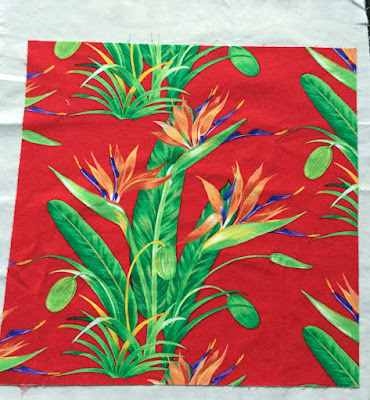 The fabric also includes 2 butterflies. I could leave them upside down but I'd rather not. 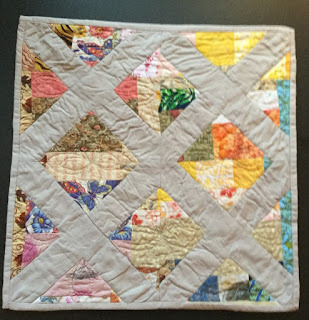 I think I've figured out how to reverse the image so that I can quilt them right-side up. I copied the image on freezer paper. 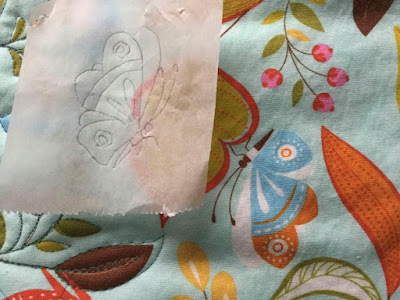 Next I'll outline the butterfly from the wrong side of the freezer paper so that it will be facing the flower. I may have to transfer that image to another piece of freezer paper so that I can iron it onto the fabric. If that doesn't work, I can always pin it down. Since I never did press the publish button, I can update this project. 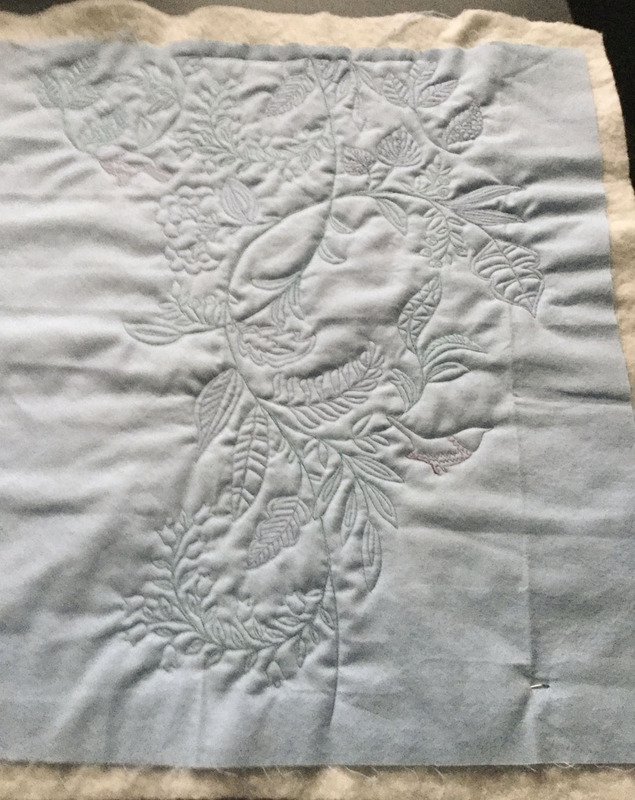 I ended up FMQ the butterfly from the wrong side of the image - I just pinned it down. It worked really well. The FMQ from the back is essentially finished. Here it the front. Here's the back. 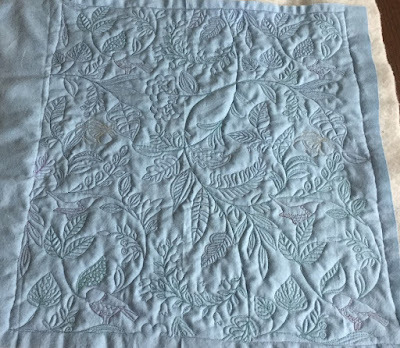 Someone mentioned that I actually had 2 quilts - one from the back and one from the front. 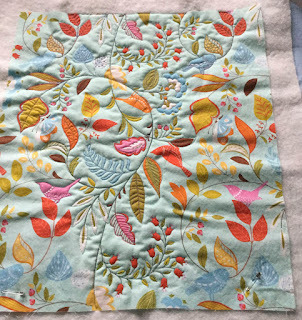 I am tempted to show the quilt from the printed fabric side, but with the butterflies moved over, it doesn't look as good anymore. Here's a close-up of the butterfly. It's not easy to see, but it will be nice once more colour has been added. I mentioned that the butterflies traced onto freezer paper worked really well. What I didn't mention is that I didn't place one of the butterflies as carefully as I should have, so that it's overlapping a leaf. I'll have to work on that from the front when I add more colour. This has been a great experiment, but I have to admit that although I love my second wholecloth piece, I'm not sure how great it will come out. I really feel that it needs more to focus on. 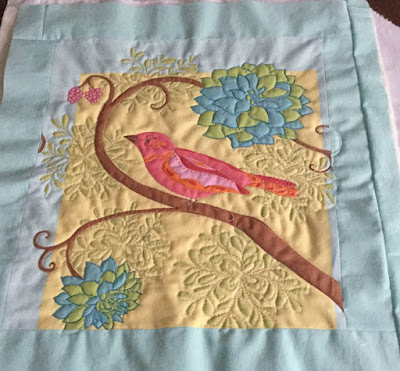 I may end up doing a lot of stitching on the birds and the butterfly so that there will be something to draw the eyes. 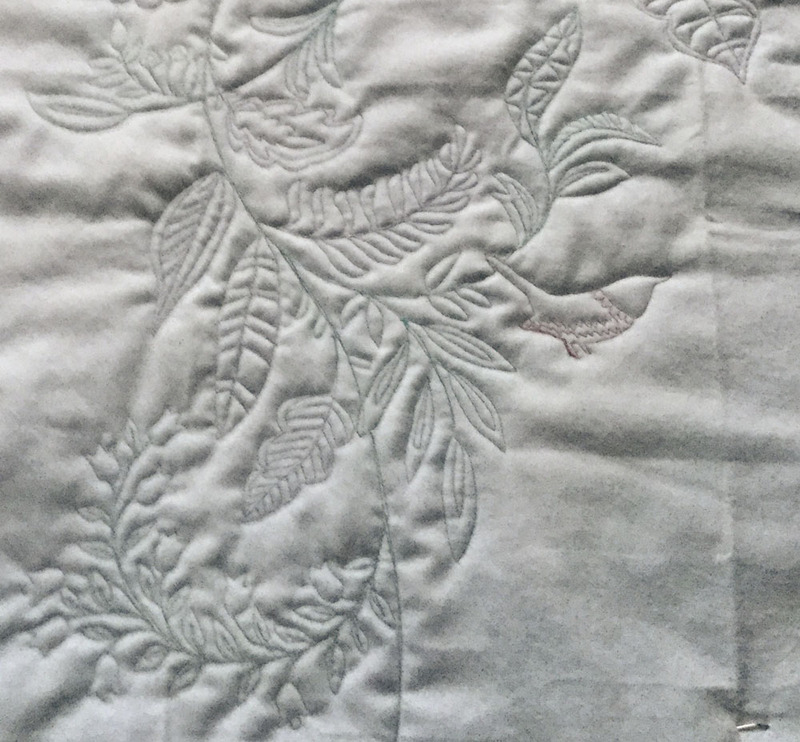 That may mean that I won't do much stitching on the flowers or leaves. That is how I intend to proceed once I start working from the front. 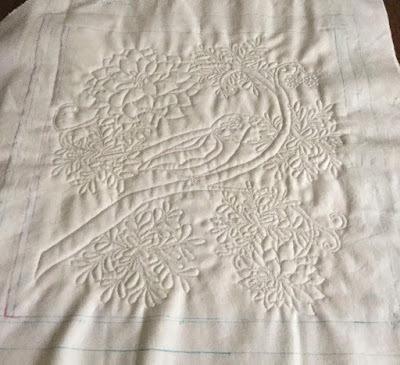 I'm not sure if I will have time to do more FMQ on this piece before the end of the month, or to even work on the other two wholecloth quilts. I have come a long way since I am really not stressing about it, except that I just realised that I have to post my Learning QAL - November Sum-up. So I will add it to the post. Oops!!! I've spent some time this weekend working on my Splash of Color QAL. My version is called Shattered Angles. As I worked on it, it all came back to me why I had been so frustrated with this project. Since I seem to be in a more zen mood, I even managed to figure out how to make the process easier. I thought that I would share some of my learning with you. 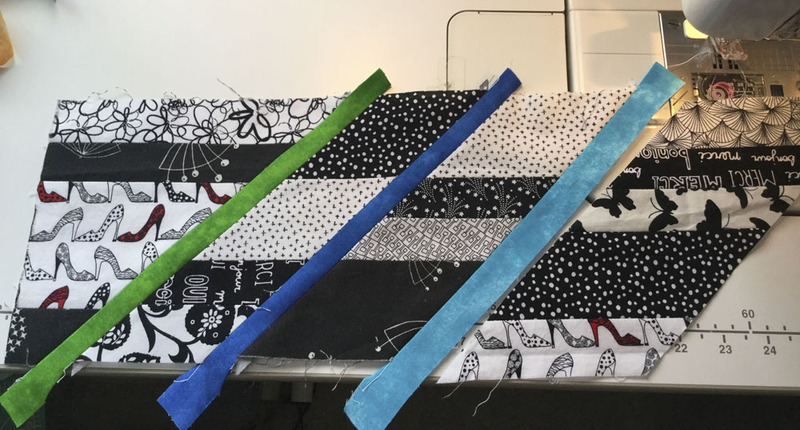 The pattern is based on cutting and sewing strips, stacking them and then cutting them at a 45 degree angle. The pieces are then moved around so that each finished strip will have different fabrics. So far, so good. My problem comes when I have to add a strip to the others, after having inserted the coloured fabric. Before figuring it out, I ended up with some very narrow strips. 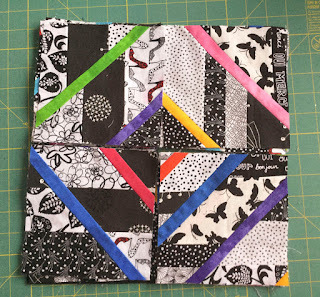 That's why my finished blocks are now 6" instead of 6½" square. 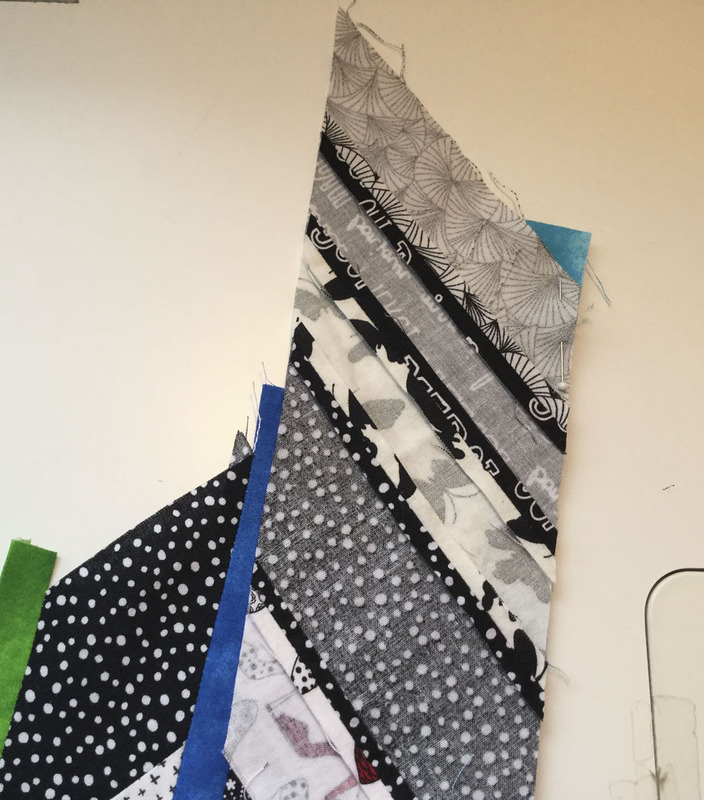 I finally figured out that if I placed a pin where the new strip and the coloured piece meet, I could then pull the fabric over and make sure that it was straight. 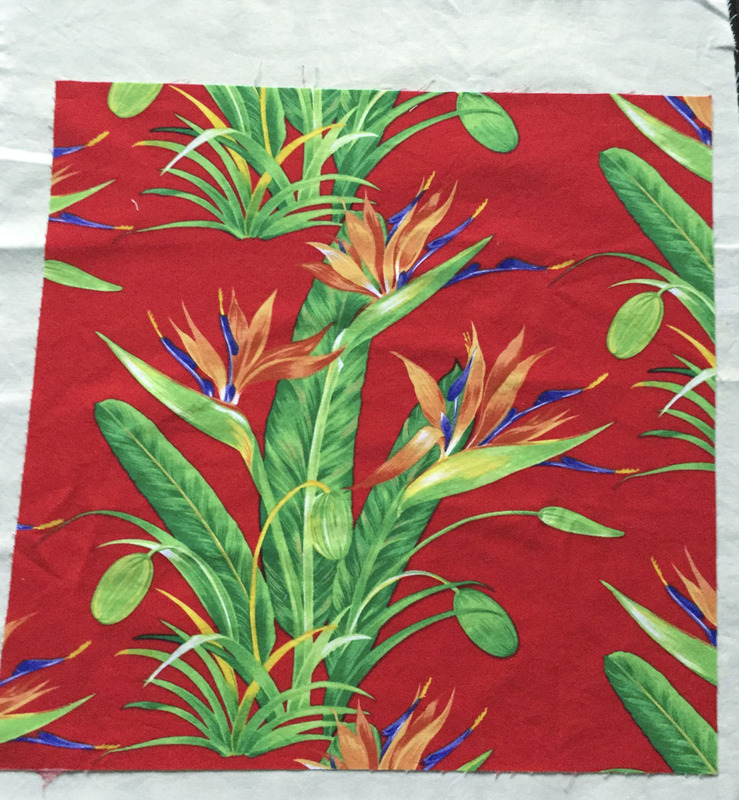 Ironed, pined and ready to sew. Here is the finished strip, ready to be trimmed and cut. I'm quite happy with the top of the strip since it's fairly straight. That's what I was trying to do! After trimming the strip to 6" long, I then cut it to get 6" square blocks. Here is my pile of blocks. So far, I have 24 completed. I made 15 of them on the weekend. 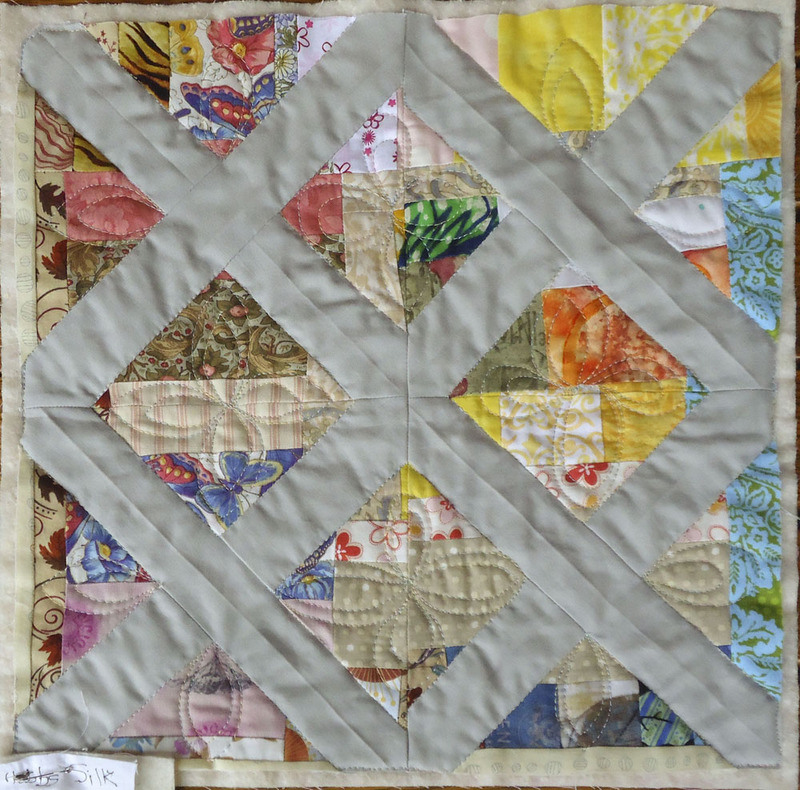 There are many options for laying out this quilt, but this is the most obvious one. Four blocks are placed together to make a kind of square box type pattern. It's best if the coloured lines don't meet, but that's easier said than done. 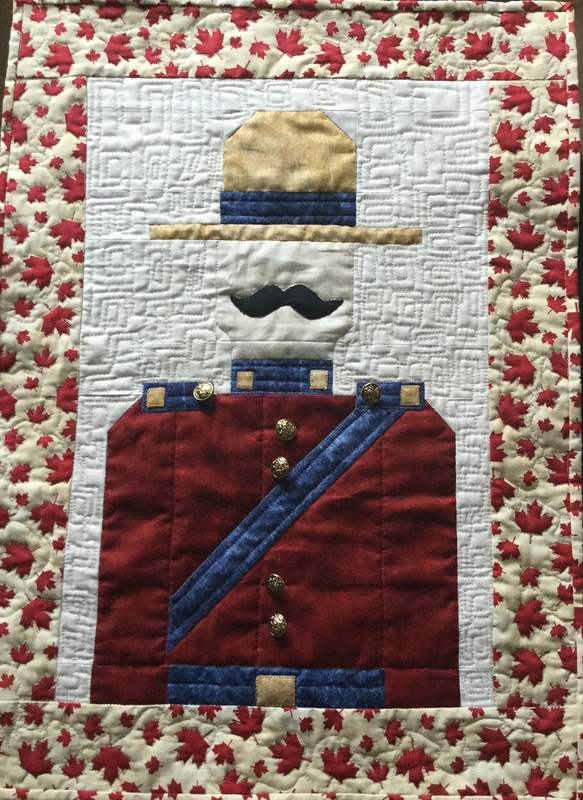 At this point, the quilt is about half done. I have put it away since I have other priorities this month. I'm not sure that I'll be finished in time for the final link-up for the quilt top (December 12, 2017), but that would be the story of my life. I'm just thrilled that I gotten ahead on this UFO! I didn't get any of the things I wanted done this week - so I'm going to try again! 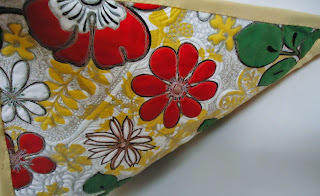 For my To-Do list this week, I'm going to work on another wholecloth quilt and add a few more rows on my batik quilt! 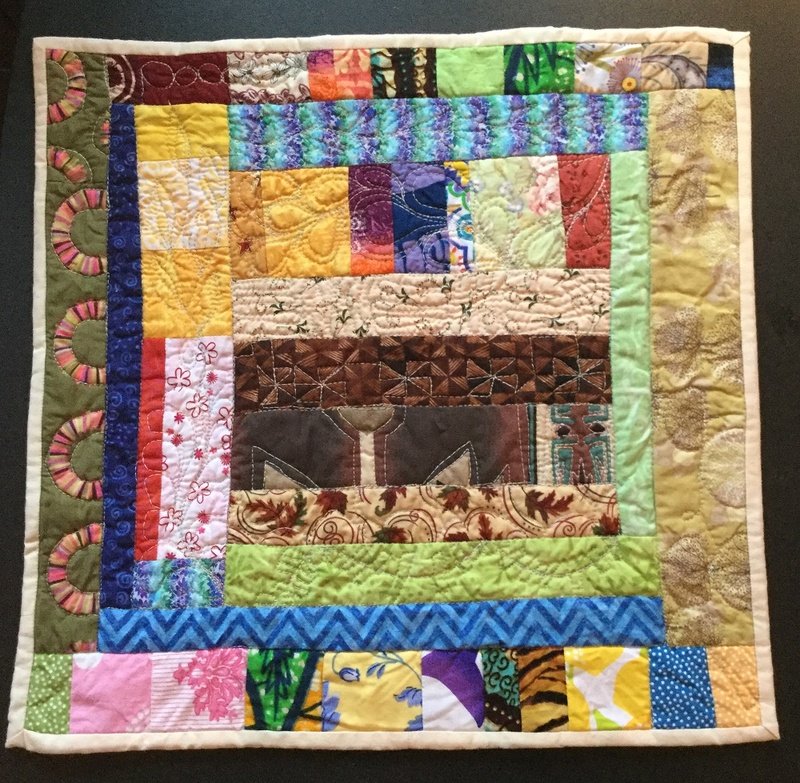 Isn't it amazing what effect your state of mind can have on your quilting? I guess it shouldn't be surprising since our state of mind pretty much affects our whole life :-) Anyway, I am glad that I was calmer and able to work out how to put these strips together. I did try out a couple of other methods but they didn't work. I don't see things easily in 3D, so it's not surprising that I had that much trouble. I'm just thrilled that it worked out. I have awesome news! 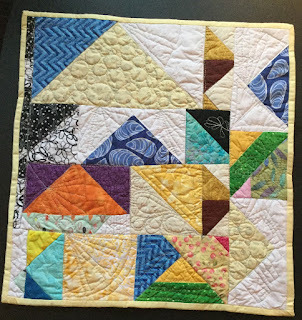 My Shattered Angles project was featured on Connie's Linky Tuesday. Check it out! It's been a busy week since the last post. I've made some progress on a couple of projects, including starting a new one. My goal for November is to create a wholecloth quilt from each different batting being tested. 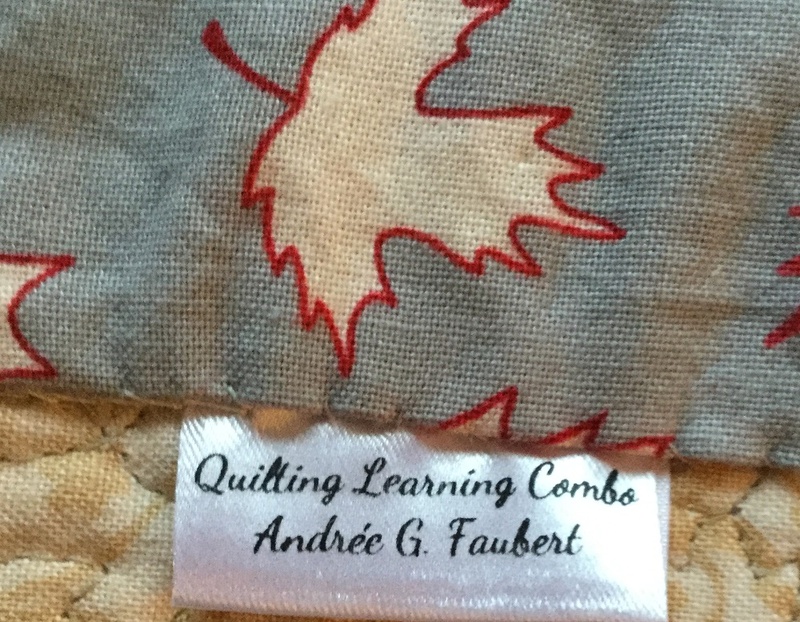 In some of the projects, the FMQ follows the design on what will be the backing. 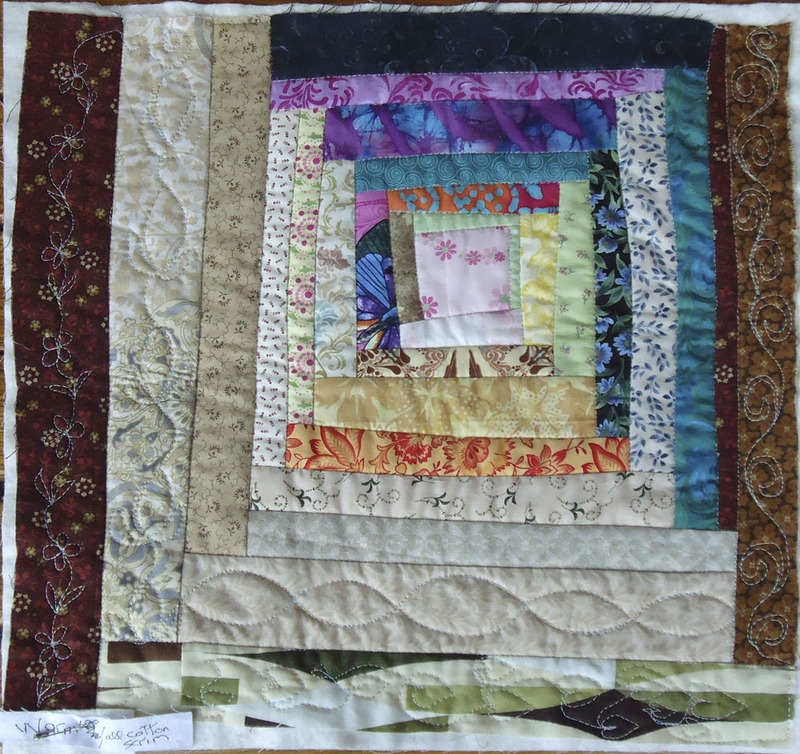 For this first piece, I began by quilting on the silk batting. 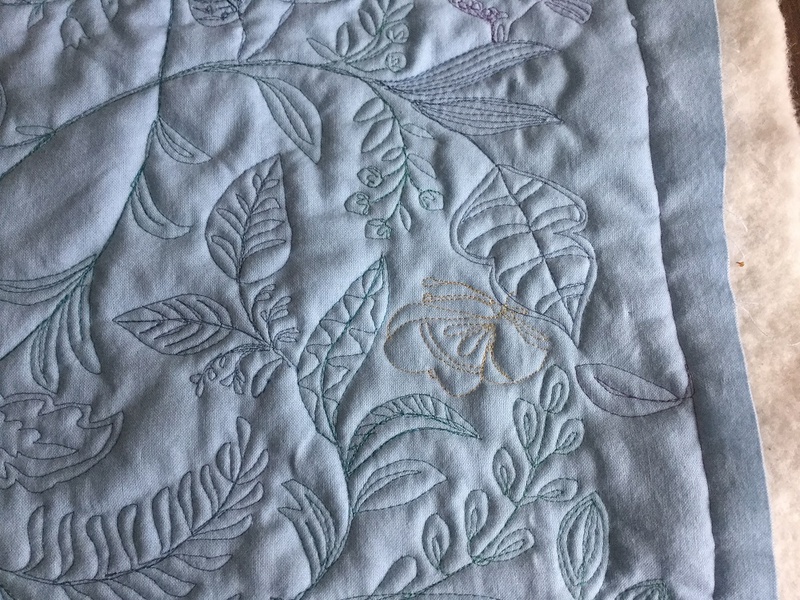 Last month I had quilted on the cotton-wool batting first, so the silk batting felt very thin in comparison. This time, the silk batting was great. For this wholecloth quilt, I used #100 Kimono silk thread from Superior Threads in both the top and the bobbin. 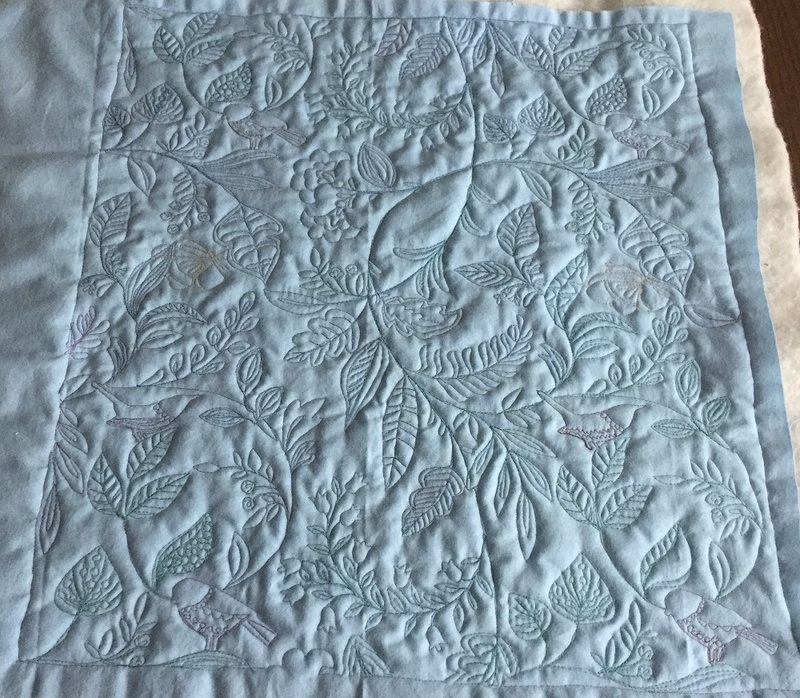 It was perfect and quilted beautifully. 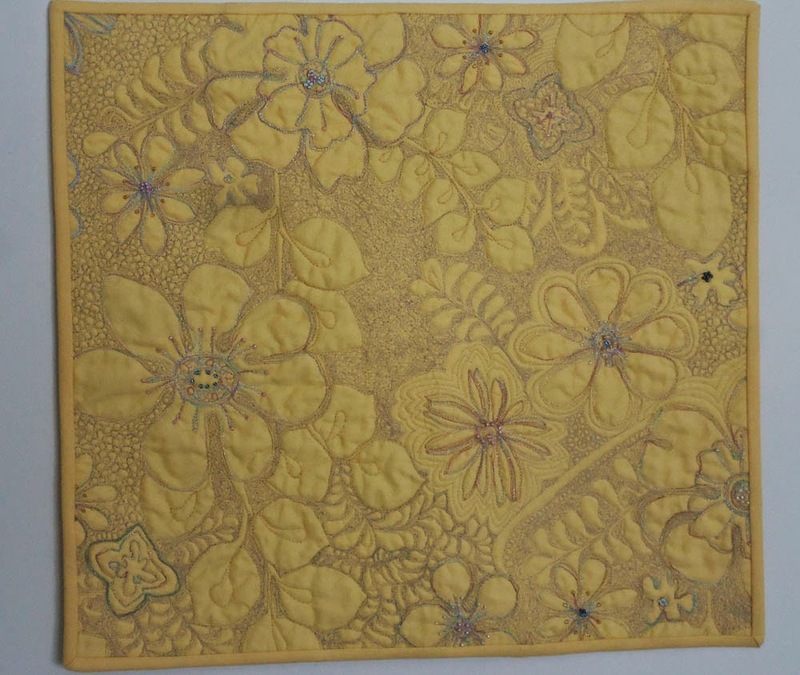 Below is the front of the wholecloth quilt. I changed the colour to off-white because I would like to try to either paint or dye the piece. This will be a learning project for this winter. I'm hoping to visit my girlfriend who is a painter. She has promised to help me since I'm pretty nervous about painting :-) I'm the kid who had a paint-by-number of the Last Supper and proceeded to paint the whole ceiling in one colour of brown!!! Needless to say, the painting (and the ceiling) were never finished. 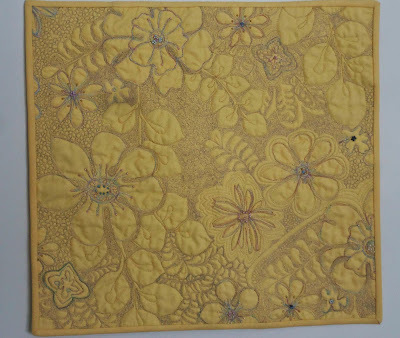 I added a border to the panel and then marked the wholecloth so that I can FMQ something interesting in the border. 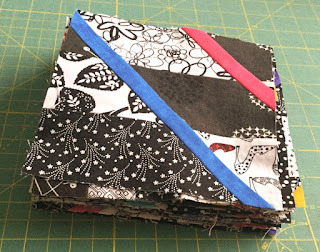 I've started another batik lap quilt using a couple of charm packs that I bought a while back. The colours are absolutely stunning. I'm having a great time working with these colours! 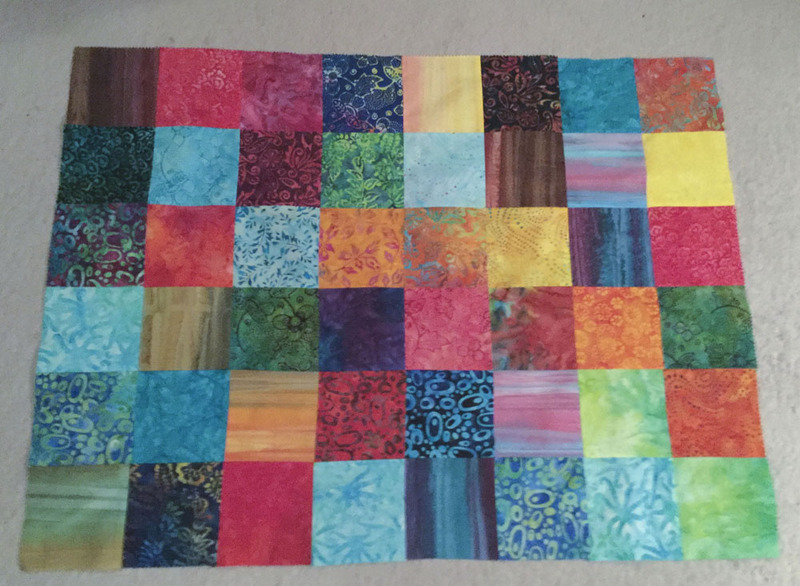 I have almost half of the quilt top pieced. 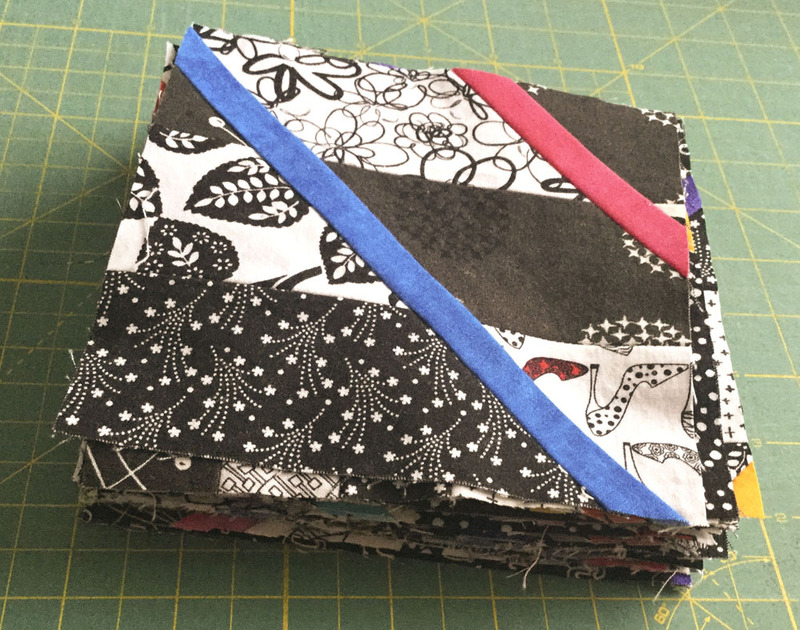 It's now time to go into my stash for more fabric since I only bought 2 charm packs but I need slightly more than that to make a respectable sized quilt (roughly 50" x 47"). 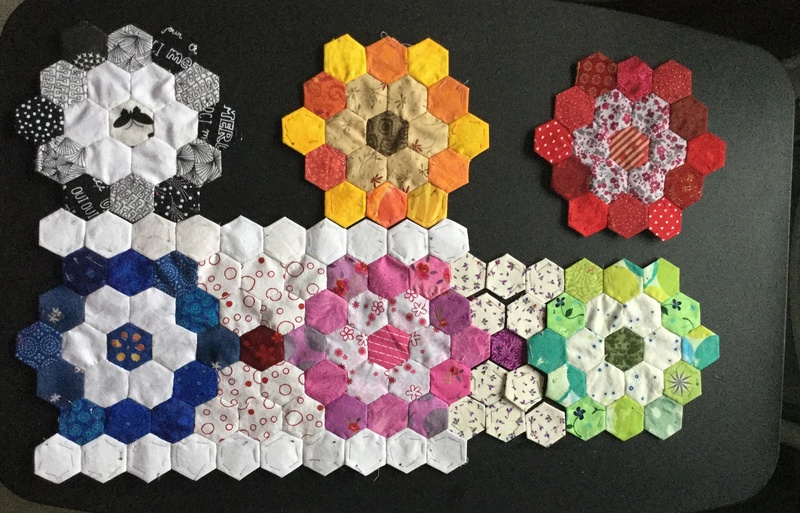 I've spent a lot of evenings working on my hexies. It's a restful activity after a day of working and thinking. 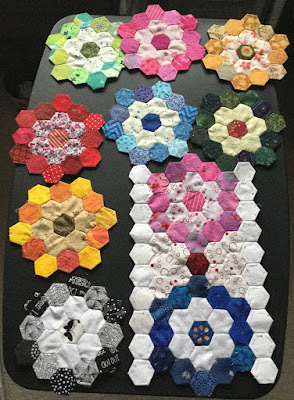 So far, I'm planning for a runner of two hexie flowers wide and possibly five flowers long. I'll see how far I get before I decide to call it done! I'm not sure that I like the white border. I could remove it (it's much easier to remove than to add! ), but I'll wait to see how it goes. It might be cool to add a border outside of the white border, possibly in all of the colours that I've used in the hexies. The fun part of working with hexies is that it's easy to try out a design by just putting them into place, before attaching them. FMQ the panel by following its outline went really well. I find it much faster than trying to figure out what FMQ pattern to use next. Since I was only outlining everything, it only took a little over an hour. That's good because if it had taken a huge amount of time, I might not be willing to try to add paint or dye to it! I even have more of these panels if I end up wanting to start over. I forget how much I love batiks until I'm doing another batik project. I really hope that I'll remember to use them more often. I get such joy out of working with awesome colours! After reading a book about Leaders and Enders, I'm really tempted to start one. 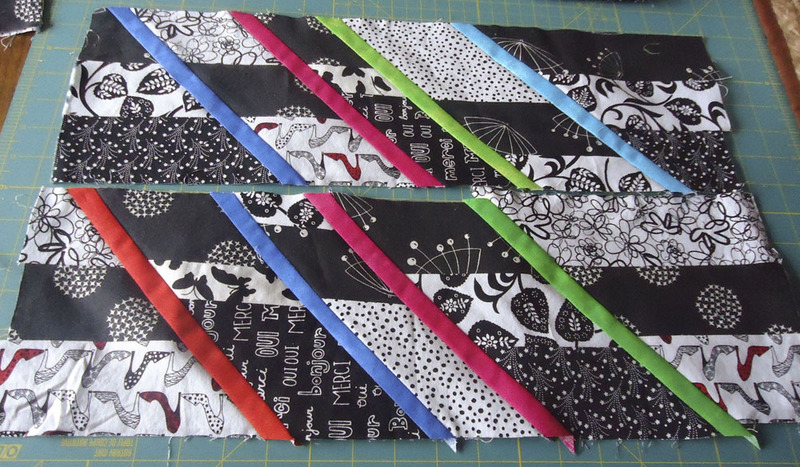 I think I may have enough batik scraps to start. That would be very cool. I'll let you know when it happens. I'm still having a great time working on the hexies project. It's great to see it grow. I've been sucked into looking at hexies and EPP on Pinterest. Oh the things I could make.... maybe.... if I had the patience!!! Speaking of patience, I just came back from listening to Kathy K. Wylie who was our guild's guest speaker. 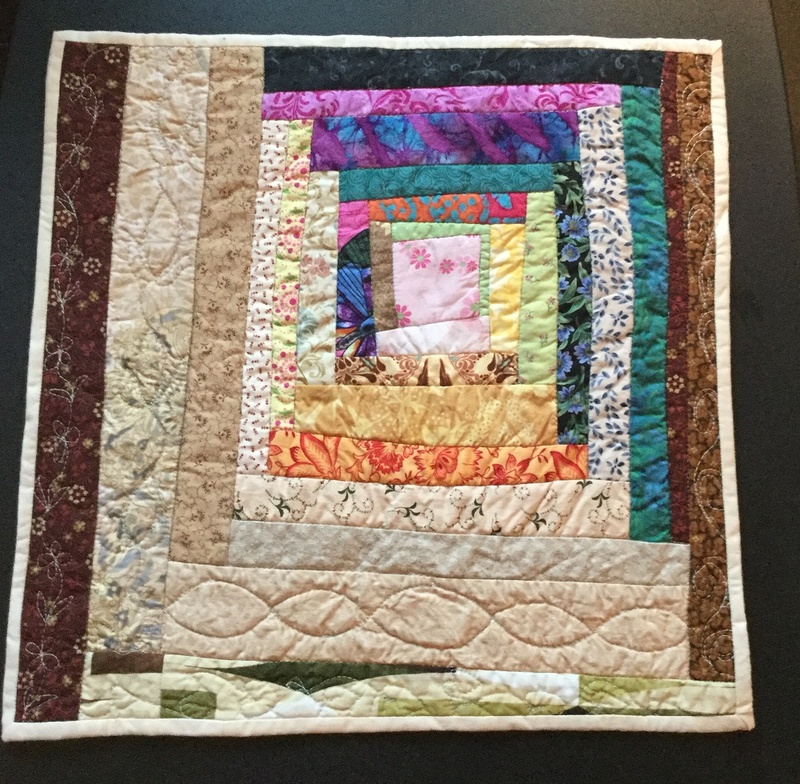 Her latest quilt, "For Such a Time As This" won first prize in Houston this fall under Traditional Appliqué. 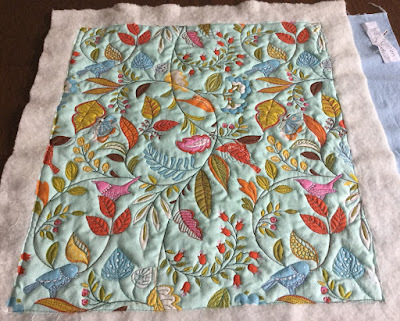 It took her 3 years to make and over 200 hours to FMQ. That is the definition of patience. Wow. Check her quilt out in the Related Links below. Kathy K. Wylie, "For Such a Time As This"
For the October Learning Quilt-A-Long, I made and quilted 4 improv pieced blocks using different batting. I've had a chance to bind, wash, air dry and iron them - it's made quite a difference, but unfortunately, not easily seen on the images. The X block was made using Hobbs Tuscany Collection silk and fine polyester (90%-10%) with resin bonded. 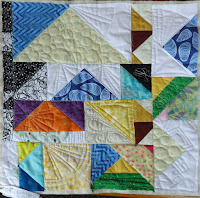 The Half-Square Triangle block was made using Hobbs Tuscany Collection cotton-wool (80%-20%) batting with resin bonded. 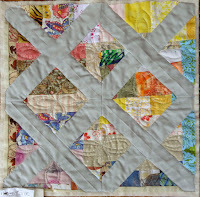 The Square Pieced block was made using Tender Touch bamboo-cotton (50%-50%) with scrim. I did steam iron the blocks since they were pretty scrunched up. 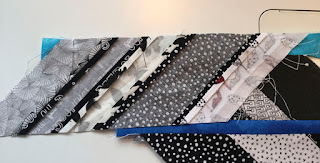 It's time to show some progress on the Splash of Color QAL. Here is the quilt block that I am making. It's called Shattered Angles. 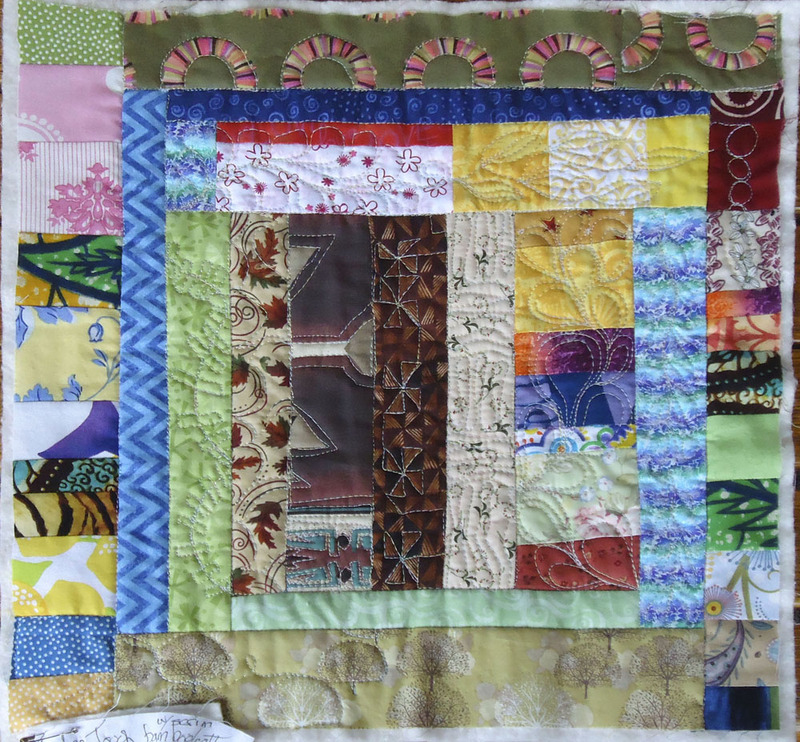 I have no idea at this time if it's going to end up as a lap quilt or just a wall hanging or runner. We'll see how quickly I get tired of it! 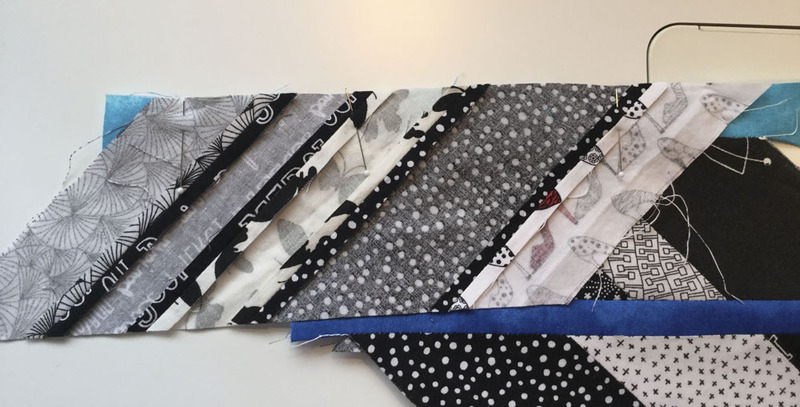 For readers who don't know me, I have a problem working with black and white fabrics. Even with the addition of a little bit of colour, I find the lack of other colours quite depressing to work with. I have finally reached the point where I'm tired of just making hexie flowers. 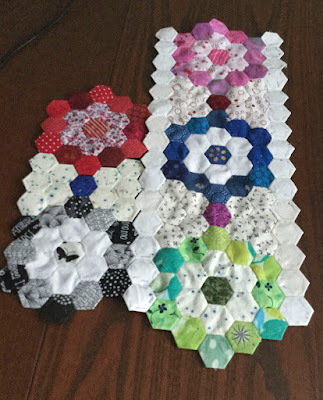 So I put all of my hexies together to what I could make, either a wall hanging or a runner. I wanted to keep this project simple, without having to make a gazillion more hexies, so I just played around until I figured out a way to put the flowers together. This is what I've come up with. So far, my plan is to put a white-on-white hexie row between each row of flowers. 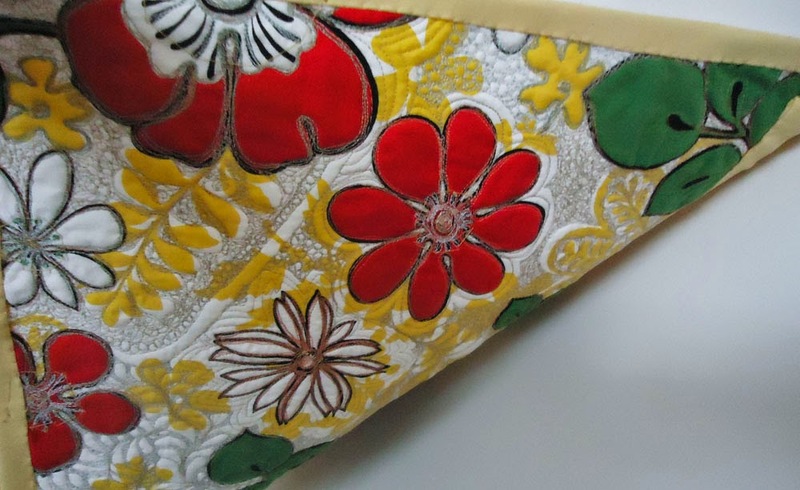 I am using coloured fabric with a white or off-white background between each flower (with a pop of colour in the middle hexie). I haven't decided yet if it's going to be three hexie flowers wide or just two. I'm also not sure how long I will make it. After washing the blocks, I'm not sure that I can tell the difference between the batting, except for the silk. It's still the thinnest and lightest. All of the batting has shrunk a little, so that all the blocks have a slightly puffy look. I can't even tell now if the wool-cotton batting has more loft after washing than the cotton and bamboo-cotton. I would have to say that the results are pretty inconclusive so far. I still want to appliqué some hexies to make a piece. I could certainly do that with any left-over flowers. I cleaned my sewing machine this morning and may have messed something up. I decided to just turn it off and hope that it's just a temporary issue. I will deal with it another day. 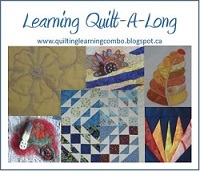 It it turns out to be serious, I may have to revise my learning goals - hand quilting anyone? Welcome to the fourth month of the Learning QAL. I hope you'll join me on my learning adventure - and make it yours! The rules are easy - post what you would like to learn this month (it doesn't have to be complicated!) and link-up your post. At the end of the month we will have a Learning Sum Up and share our learning. You don't even have to finish the project as long as you post about what you learned. There is even a prize for a lucky person who has linked up to both the Goal Setting and Sum Up! There must be something you have to make soon that involves learning something new! So please join in the fun. 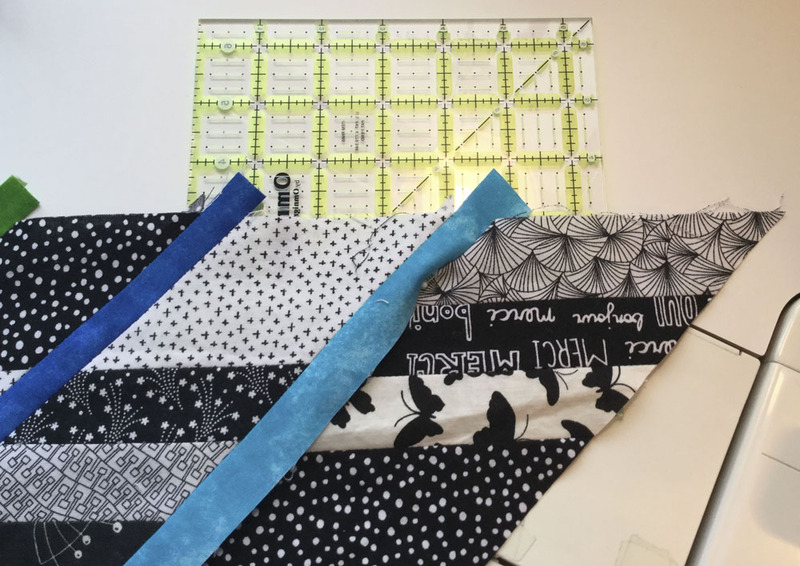 In October, Mel of Mel's Quilting Blog wanted to try out Terial Magic and see if she should use it to make a T-shirt Quilt. 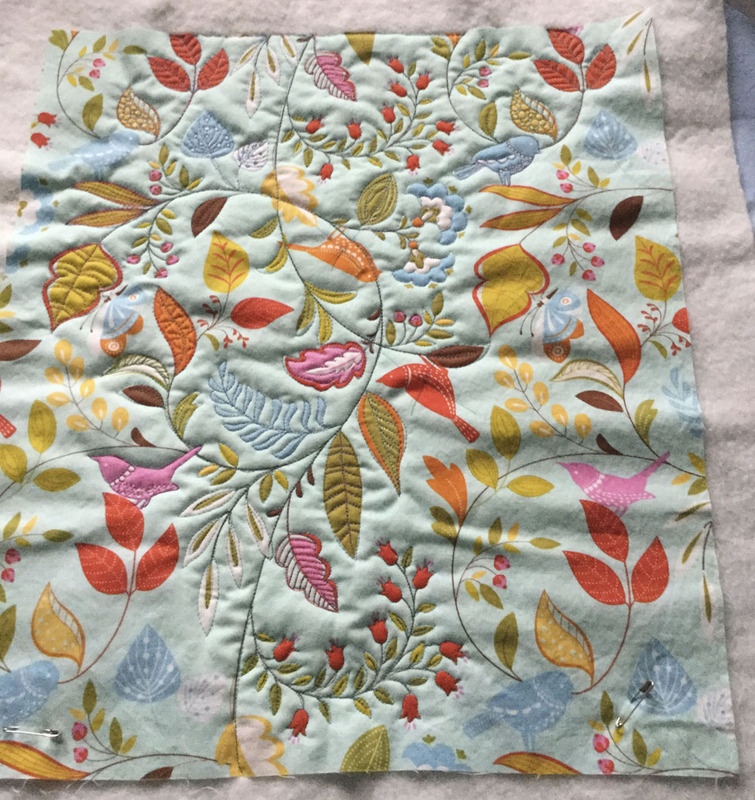 She used the stabilizer on a t-shirt and made a pillow - and learned that yes, she liked the product and would use it for a whole quilt. I've never heard of Terial Magic until now. Sounds like a great alternative to ironing stabilizer. Thanks Mel for sharing your learning. You are the winner of a $20 certificate from Connecting Thread! Congrats! I'll be searching this month for a few ideas as prizes for participating. They will be listed in the November Sum Up and the winner will choose the prize she wants! Each prize will be roughly a $20 value - so get that post written and join in! 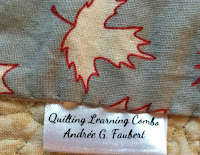 My October learning goal was to try 4 types of batting to learn the difference in how they handled when quilted. Since I didn't get a chance to bind and wash them by the Sum Up, there wasn't much to say except that the silk batting was very thin and the cotton-wool batting had more loft that the regular cotton and bamboo-cotton batting. 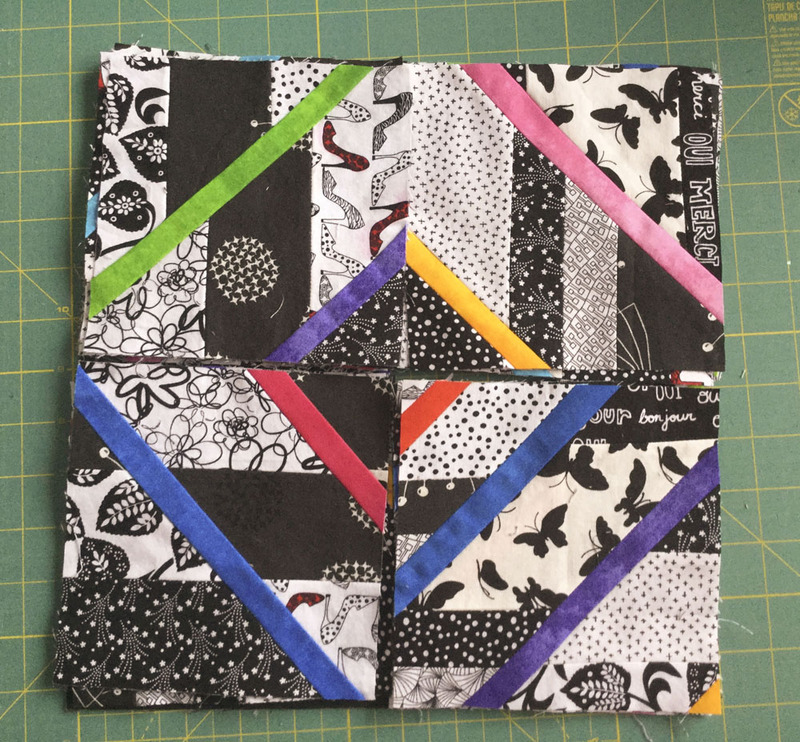 I also had a chance to try out some new improv blocks and practice my free motion quilting (FMQ). I would say that the experiment was a success, but wasn't finished. In the next few days, I will write a post on the washed and finished blocks. Look out for it! This month, I will continue the batting experiment. 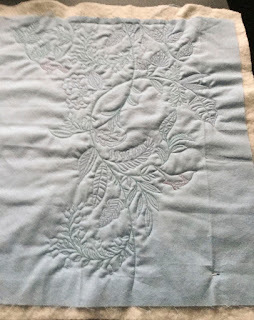 The time, I will be comparing the batting to see how they handle different threads as I do some free motion quilting (FMQ). I have a lovely collection of silk threads as well as cotton and metallic threads that I can't wait to use! 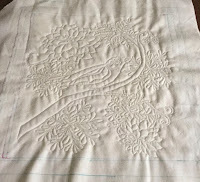 For the first three, I will be using a technique that I learned from Cindy Needham in her Craftsy course, Machine Quilting Wholecloth Quilts. It's called Large Print Wholecloth Quilt. Essentially it involves FMQ using the backing fabric as a template to create a wholecloth quilt in the front, on a solid fabric. 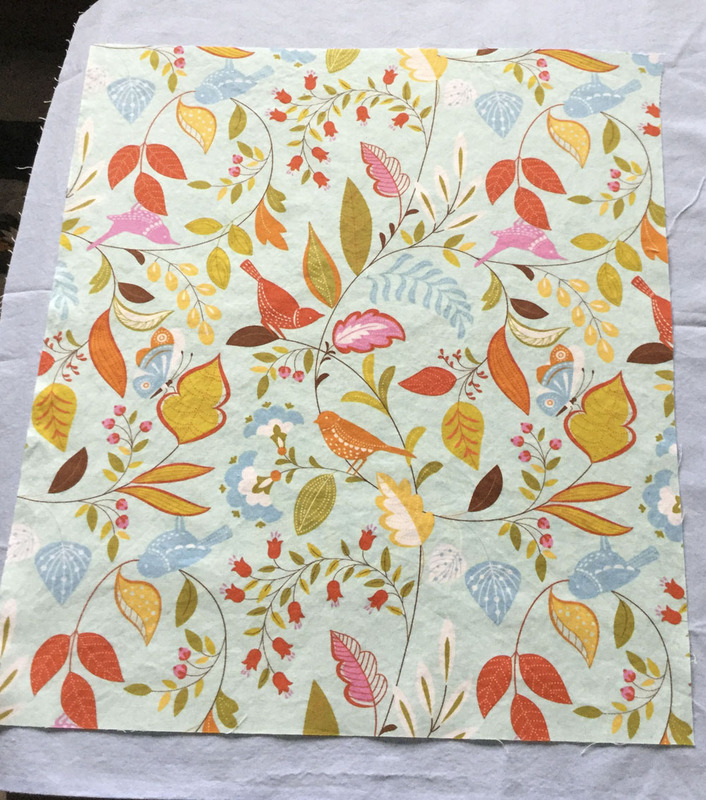 Here is the wholecloth quilt that I originally created, using this wild fabric as a template on the back. For more details, see Free Motion Quilting Madness in the Related Links below. I'll be using these prints to create wholecloth quilts. 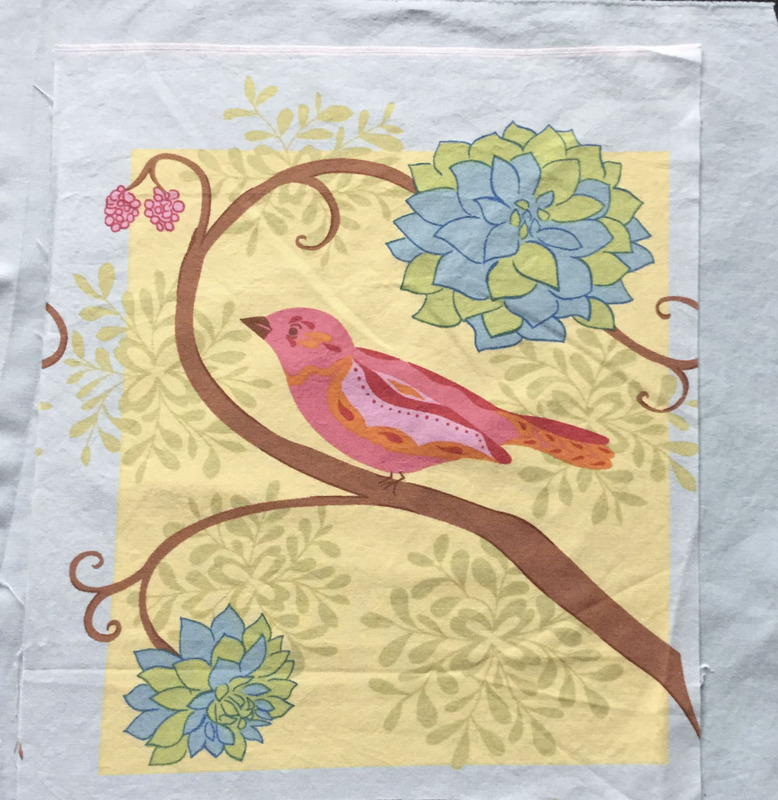 The solid fabric behind the print will end up being the front of the quilt. 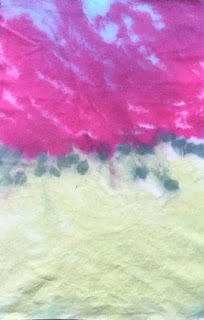 For my last piece, I will be FMQ this fabric that I hand-dyed this summer (as my August Learning Goal). One month isn't very long for learning something new. I like that I can keep learning based on the initial idea of using different batting for various projects. No matter how much I actually get done, there is guaranteed to be learning involved!! !